When I first heard of these, I had my reservations about them as a lot of products claim to remove stains, but few actually work. The point of these wipes, is that if you spill food or drink down you while you are out and about (or indeed at home equally), you can just take out one of these wipes and use it to remove the stain so you don't have to walk around with the stain on you all day. My husband was first to try one after spilling some curry on himself and he said it worked wonders and brought out all of the stain. I'm not very content on taking someone elses word for it (even if it is my husband), so I still was (for once) looking forward to spilling something down me to have the opportunity to try out one of the wipes for myself. Far be it from me to disappoint myself, and I ended up spilling some cola on my top, so I thought it would a perfect opportunity to try out the wipes for myself. It's quite simple, you just rub on the stain with the wipe before the stain dries in. And amazingly, it works. It's not effortless, but it is very easy. A little scrub on the stain with the wipe and the stain actually does come out and when it dries out there is no visible residue or marks and the stain is gone. These are really very wondrous little creations that come in a pack of 5 wipes. I would highly recommend you carry a packet of these around with you whenever you go out and about and they really are fantastic. They are a good fast stain removal product for those little spillages of food and drink that are unavoidable at times. They are very easy to carry around making them perfect to pop into your bag or pocket and take with you when you are going out. 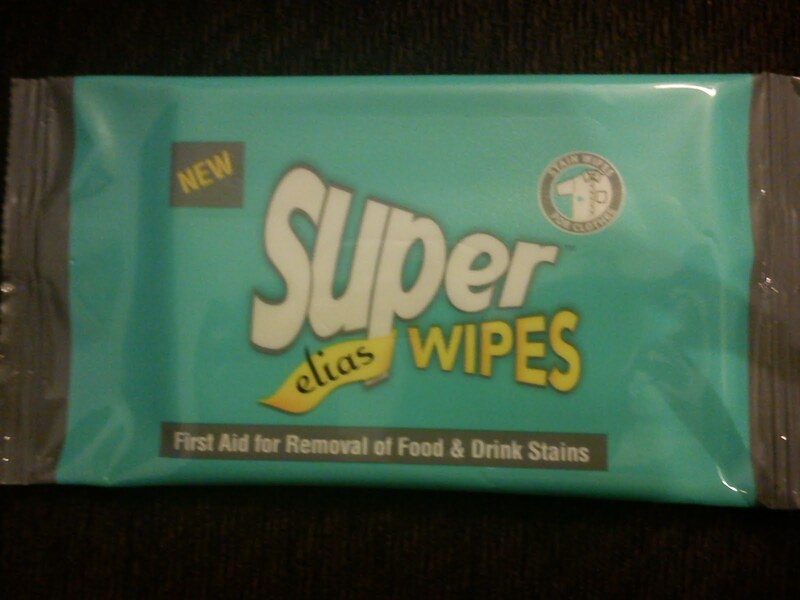 Elias Superwipes are available at www.elias-products.com and cost £2.49 for a pack of 5 wipes.